Lost among Apple’s announcement of a new streaming TV service, subscription game service, and fancy new titanium credit card was the release of iOS 12.2. And while the most significant new thing in iOS 12.2 is Apple’s updated News app, anyone even remotely concerned about security will want to download the latest version of iOS ASAP as it contains 51 different security fixes. Covering a range of devices from the iPhone 5s and the iPad Air in addition to more recent products, the iOS 12.2 update includes patches for vulnerabilities in core apps such as Contacts, FaceTime, Mail, Messages, and more. 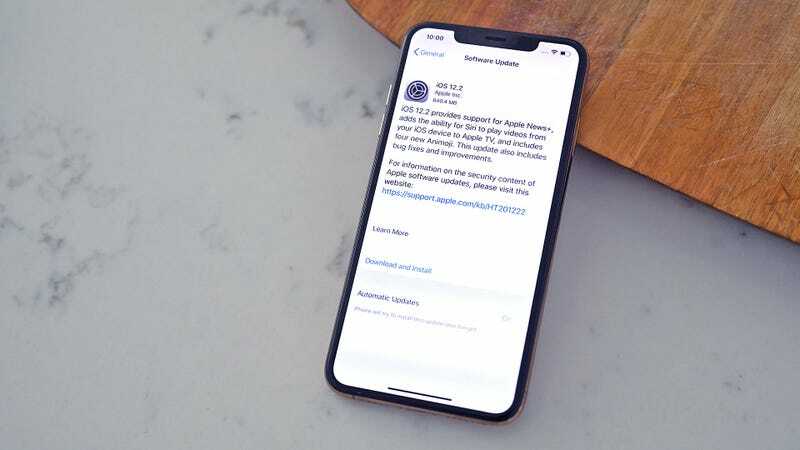 On top of that, iOS 12.2 also includes security updates to deep parts of the operating system itself including its kernel and power management, not to mention a whole host of WebKit fixes that should have a big impact on the safety and privacy of your data when using Safari. For example, one of the security vulnerabilities fixed in the update allowed sites to access your phone’s microphone without any indication to you. Yikes. Security updates aside, the update to iOS 12.2 also brings with it four new Animoji (owl, boar, giraffe, and shark) for recent iPhones and iPads (iPhone X and newer), new dedicated TV controls in Control Center and on the lock screen when using AirPlay, and support for the recently released 2nd-gen AirPods. On the entertainment front, while we’ll still have to wait until later this spring to get the next batch of Apple TV updates, iOS 12.2 will now give you the ability to play any video, show, movie or sports game in Apple TV just by asking Siri. Meanwhile, in Apple Music, the new Browse tab features more highlights on a single page, which should make it easier to find new music and playlists. To see the full iOS 12.2 release notes click here, or go here to see a more detailed list of all the new security updates. And regardless of whether you’re more concerned with addressing your security or trying out new features, if you’re running an old version of iOS, you should seriously consider updating all of your Apple mobile devices if you haven’t done so already.